irelandphoto.com >> local history >> Heaven's Poison at Dunlewey. At the end of Dunlewey lake, inbetween the sweeping forests of the Guinness estate and the quartzite bulk of Mount Errigal, lies the Poisoned Glen. But where is the poison in this most loveliest of places? The sloping sides of the glen are home to wild deer, not witches’ potions. No alchemist watches over this valley, but the silent snow-tipped shape of Slieve Snacht. As with all the best stories, there are different versions. The most popular centres around the mythical Balor. Balor was king in Tory. He had a daughter more beautiful than any eye could behold. Such was her radiance, and such were the ethics of the day, he imprisoned her in a tower, never to come within sight of man. But as things would have it, legend of her rapturous looks spread, and had the reverse effect. Balor was obviously unaware of the powerful effect of hype. Attempts on her tower became quite the thing among the men folk, and it wasn’t long before one succeeded in breaking in and taking her away. Balor followed her across the seas to Magheroarty and stalked her captor across the mainland, killing him with a giant stone. 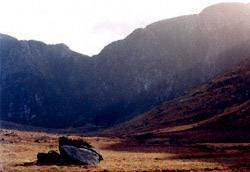 One such stone stands in the entrance to the Poisoned Glen, and is said to be the evil, or poisoned, eye of Balor. We might do well to heed this story today, and its underlying symbolism. For beauty itself is innocent, and it is only poison, in the eyes of those who would seek to imprison it for themselves, that makes it otherwise. Want to hear the true story? The Irish word for poison, “neimhe” (pronounced niv-uh), differs in its spelling by only one letter from the word for Heaven, “neamh” (pronounced nyow-uh). The glen used to be called the Heavenly Glen by local people, as it was, to them, like they imagined Heaven itself to be. It was, predictably, an English cartographer who made the mistake in translation that was to ‘poison’ the name of one of Ireland’s most beautiful places for ever. Did you know that there is only one lake in Scotland - the rest are all Lochs? The Lake of Menteith, as it is called, was similarly mis-translated by a Dutch cartographer. Jesus said, in the middle of a heated debate on dietary habits, that it is not what goes in the mouth which poisons people, but what comes out of it. With people, as with places, sometimes a name just sticks.